We're going to tell you all about the Lumia 735, but first we're going to take a selfie. People have moved on from snapping pictures of weddings and graduations. Now, they put themselves in the picture. And Microsoft’s Lumia 735, available today on Verizon for under $200, was designed for exactly that. Microsoft has designed the Lumia 735 explicitly with selfies in mind: there’s a 5-megapixel front-facing camera, and even the 6.7MP rear camera can be aligned on your face with the built-in Lumia Selfie app. It’s also worth noting that the phone ships with the Lumia Denim firmware, which helps the phone fire off quick shots. Verizon will charge $192 for the Lumia 735, or $8 per month (for 24 months) on Verizon Edge, when it ships next month; you can preorder it now. Verizon has also tossed in a year’s subscription to Office 365 Personal, which adds another $70 worth of value to the whole affair. When Microsoft announced the Lumia 735 last fall, the company expected you’d pay about $288 for the Lumia 735; the price has dropped significantly since then. Think of the Lumia 735 as the little brother of the Lumia 830, with the Lumia 830 carving out a niche as the “affordable flagship” of the Lumia line. 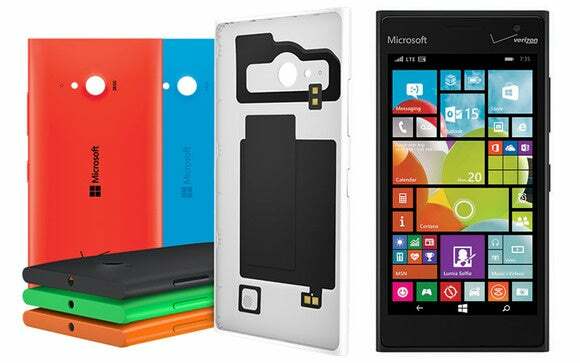 The Lumia 735 is nothing fancy; in fact, besides the emphasis on selfies, little stands out. In general, there’s a good mix of low- to midrange components inside the Lumia 735. It ships with a 4.7-inch, 1280x720 OLED screen with sunlight readability enhancements and a high brightness mode; 1GB of memory; 8GB of internal storage; and a Qualcomm Snapdragon 400 quad-core chip running at 1.2GHz. A removable 2,200mAh battery is also included. The phone weighs 134.3 grams and measures 134.7 mm x 68.5 mm x 8.9 mm. Since the phone runs on Verizon, however, it also supports the carrier’s XLTE network. While the phone can be charged with a wired charger, Microsoft also has provided a line of wireless charging docks in orange, green, white, red, and cyan, that can be purchased for an additional $25. Why this matters: For all of our myopic focus on flagships, readers keep telling us that price matters—a lot. With the Lumia 735, Microsoft has pared down the feature set to what most phone users tend to do: take selfies, browse the Web on a high-speed network, and run a few apps.